Hey ladies! 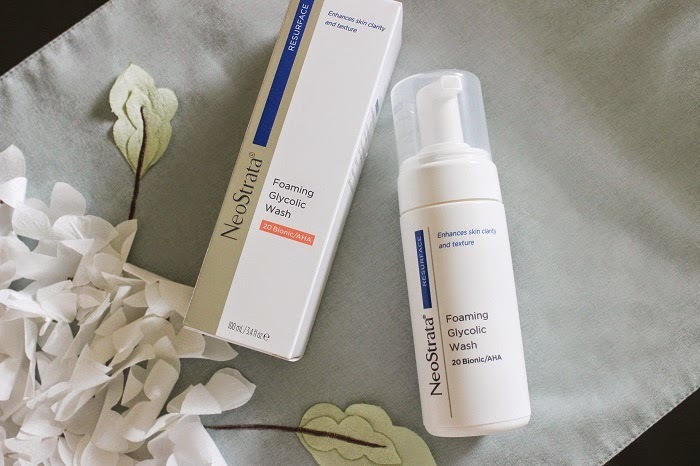 I'm excited to talk about this new product that I'm in obsessing over lately from NeoStrata which is their Foaming Glycolic Wash. I've never actually heard of this brand before but with one quick Google search, I discovered that it's quite popular in various countries! So, of course I had to test it out. Lately, I've been noticing that my skin has been looking harsh from the bipolar weather and slowly recovering from the stress of finals. I needed something that would clear up my skin as quickly as possible and was lucky enough to test out this new product. This isn't my first time using a face wash with Glycolic acid in it but for those that are new to it, it's a type of chemical that specifically smooths skin texture, unclogs pores, and stimulates cell renewal. It's great for all ages but I highly recommend it for people looking for anti-aging products! Based on what's written on the bottle, it's soap-free, dye-free, and pH balanced along with having a high concentration of Glycolic acid (18% to be exact!). For first time users of Glycolic acid, it might be a bit too harsh so perhaps try a product with a lower level to see how your skin reacts before trying this one. It also contains 2% Lactobionic acid which is what stimulates the cell renewal process. Since it's high-strength, it is recommended to use sunscreen if you're going to head out after using this product. Personally I didn't have any problems with that since I always moisturize after washing my face and it contains sunscreen in it. Anyways, let's get to the results. The directions say to use it twice a day which I thought was a bit overwhelming since I'm used to using face wash once a day. I assumed that I would have to moisturize more often because of this, but the wash didn't dry out my skin and I only had to use toner. Fine by me, one less thing to do in the mornings! haha. I noticed from the very first time that I used it, that it made my skin feel refreshed and looked brighter. Without makeup, I normally have some red patches on my nose yet it seemed to look lighter after my first use! As for the packaging, I love the fact that the bottle has a pump which makes it so much easier to use. After using this for 5 days, the biggest changes was that some of the tiny pimples on my forehead and nose along with my sun spots was fading. In my experience, sun spots are always the hardest to get rid of especially if you got them a while back. I've tried all sorts of products specifically for sun spots but the quickest results I've seen is with this product. Totally impressed! Overall, my skin looked much healthier and I had a more even skin tone. The results seemed to last even when I stopped using the product for a few days to see if there was a difference. I'm looking forward to seeing what other changes my skin will experience after a couple of weeks of use. If you would like to purchase the face wash, head over to Neostrata.com and buy the 3.4 oz (the one pictured above) for $40. Some would say that the price is a bit steep but compared to other high end brands, I actually don't think it's too bad since the results are worth it.